Hands-free, wire-free connection up to 30 feet from any Bluetooth-enabled device (mobile phone, MP3 player, etc.) or Bluetooth PC adapter! Great for use with PC softphones such as Express Talk. Bluetooth Behind-the-neck Wireless Stereo Headphones are a light-weight, portable stereo headset with a sporty orange design, making it easy to talk, communicate, and enjoy music handsfree. Designed for the young and young-at-heart, this trendy stereo handset brings mobility to life with its on-the-go, over-the-ears concept. Surround yourself with stereo sound and enjoy! Foremost in the long list of its features is the superior sound quality which allows for usage beyond the normal headset like listening to crystal-clear music completely handsfree. If you like the convenience of listening to music and managing phone calls without wires these wireless Bluetooth headphones are for you! PC doesn't have Bluetooth? If you have an available USB port this simple, inexpensive USB Bluetooth adapter will enable Bluetooth wireless communications on your personal computer. *You must have a plug adapter to convert to your power plug type if you are going to use this product outside of North America. These can be purchased from your local electronics/hardware store. 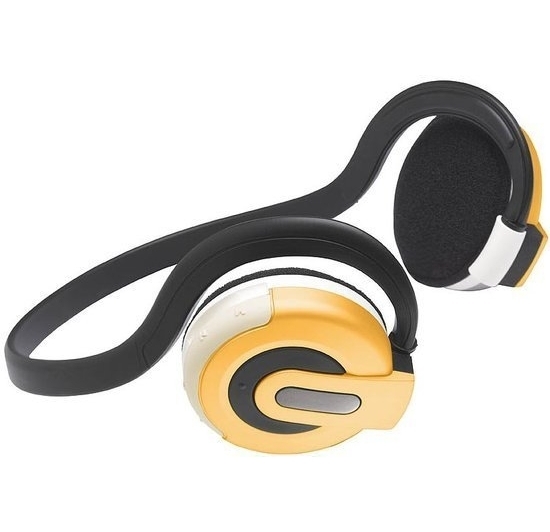 Bluetooth headsets work within a 30 foot range from a Bluetooth enabled device or adapter.